This review might need a bit of a disclaimer. You see, the author just happens to be my husband’s cousin. Before she was Christina Rich, she was Christina Garrison. But she and her husband, Cody, were married several years before we were, so we never actually had the same last name at the same time. Anyway, she is a wonderful woman! We do not get to see each other very often since we live in different states, but I have always enjoyed the time I have spent with her! Of course when she came out with her first book, The Guardian’s Promise, this spring, I was very excited! I bought a copy the first week it was released! I knew I would love the book because I love Christina, and I know her heart beats strongly for Jesus. I was right in my prediction – the book is a great read! 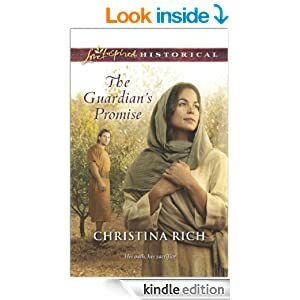 Guardian’s Promise is available either in a paperback or e-book edition! Honestly, while I do like to read my Bible, I am not always a fan of biblical fiction. After reading The Guardian’s Promise and Christina’s other title, The Warrior’s Vow, that just might change. Christina would be the first to tell you that her goal in writing the book is not to replace the Bible. Yet I do feel that her story added to my understanding of the Bible by bringing the reality of the Bible to life. The story of her focus: how King Joash became Israel’s King long ago. Especially after having children, the story about King Joash in the Bible did stick out to me. After all, becoming a ruler at age 8 is might bit unusual. While I do love and appreciate my boys, my older two who are not past that age would still not be adept at reigning over a kingdom. They definitely were not ready at the ripe old age of 8. Christina’s book portrayed Joash a child wise beyond his years. Of course, having to be in hiding would do that to a person. My favorite part of the book: imagining the tunnels. Someday I hope that Christina will write a blog post about how she came up with this concept. Knowing a bit about Israel’s geography, I could picture this as being a true possibility. That definitely added a bit of suspense – I loved trying to figure out how they were going to escape from those trying to hunt down the young king. I was pretty sure that the book was going to have a happy ending. After all, King Joash does survive to become the king. Yet the plot did have enough twists and turns to still make me wonder. I would recommend The Guardian’s Promise to anyone who enjoys a good romantic suspense novel. With the book being well-researched, the biblical setting will also add to your knowledge of the Word of God. Just like I expected, you wrote a great premiere novel, Christina!